Do your kids love eating breakfast for dinner? Well, if you are dining out you can visit IHOP and between 4 and 10 pm kids eat free with the purchase of each adult entree. There are more details at Kids Meal Deals. Thanks goes to $30 Weekly Grocery Challenge for the reminder about this promotion, she says it ends on September 13. We saw this sign when we were at IHOP during our vacation and were wondering when this deal would end. 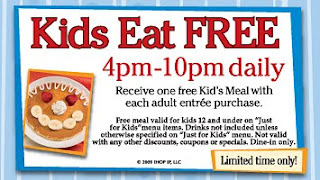 For more “Kids Eat Free” deals please visit KidsMealDeals.com.